The word broccoli, from the Italian plural of broccolo, refers to “the flowering top of a cabbage”. Broccoli is classified in the Italica cultivar group of the species Brassica oleracea. Broccoli has large flower heads, usually green in color, arranged in a tree-like fashion on branches sprouting from a thick, edible stalk. The mass of flower heads is surrounded by leaves. The vegetable most closely resembles cauliflower, which is a different cultivar group of the same species. This is an adaptation of an Alice Waters recipe found in her cookbook, “The Art of Simple Food”. Cut the stems from the florets of the broccoli. Trim off and discard the dry ends of the stems, and peel the rest and slice thinly. Divide or chop the florets into small pieces. Gently heat olive oil in a Dutch oven or heavy-bottomed pot over medium-low heat. Add garlic and shallots. Sauté until garlic takes on a little color. Add broccoli and cook for a few minutes, stirring occasionally. Sprinkle in chile flakes and salt, then add 1 cup of cold water. Give the broccoli a final stir, then bring the mixture to a boil. Lower the heat to a bare simmer, cover the pot tightly and cook until broccoli becomes very tender, a little over an hour. Stir occasionally and add more water if the broccoli starts to dry out and stick. When the broccoli is completely tender, stir briskly (the broccoli will begin to resemble a coarse purée) and add fromage blanc. Taste for salt, stir in chopped parsley and drizzle with extra-virgin olive oil. Serve at once. This is excellent served over pasta (as pictured above, over freshly-made tagliatelle), on croutons or toasted Italian bread as a type of crostini, or as a side dish all by itself. If you omit the fromage blanc, it becomes vegan. Time: A little over an hour (not including prep). 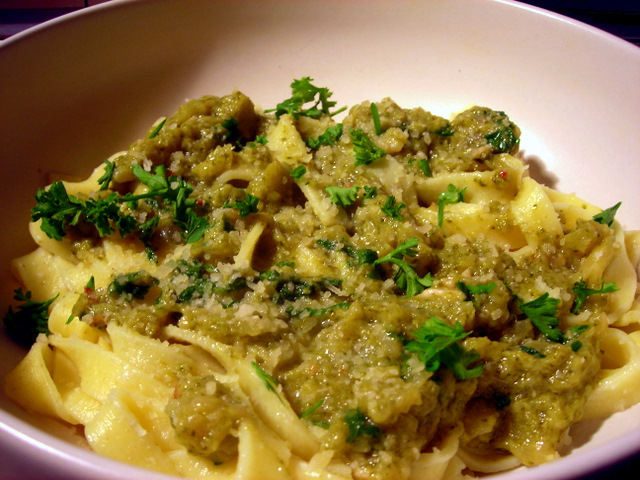 This is my submission for Presto Pasta Night #210, a weekly food-blogging event hosted by Three Cookies and organized by Ruth of Once Upon a Feast. 15 Apr	This entry was published on April 15, 2011 at 9:19 am. It’s filed under food, general, spring, vegan, vegetarian and tagged broccoli, dinner, pasta, seasonal and local, vegetarian. Bookmark the permalink. Follow any comments here with the RSS feed for this post.